8th NUEU 808-06 | What Car? The lenses are polarised (which helps reduce glare) but they didn't perform as well as the more expensive brands when it came to improving contrast. The lenses we tested had a 'gunmetal' (06) tint, although other colours are also available. As for the frames, they are light, but the arms didn't grip the sides of our testers' heads well, so they were a bit loose. These were the second-cheapest pair of driving glasses we tested. At 30, they might sound like a bargain next to the Serengetis and Oakleys, and you get a swanky hard case thrown in. However, we reckon the cheaper SXUCs are just as good, and they look a bit more stylish. Not great, but then they only cost 30. The plastic lenses feel flimsy and the arms don't have enough spring to keep the glasses glued to your head. Overall, no better than the SXUCs, which cost half the money. 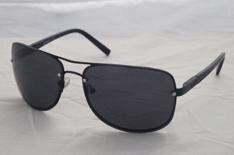 The lenses are polarised, and block out UV light to protect your eyes. Different lens tints are also available, which should be better for driving. Not available on prescription.